GM knew that their Fishbowl was a winning product: more than 4,700 TDH/M-5301/2 units were sold in North America in just 3 years. More importantly, these big transits and their 35-foot sisters provided GM engineers with a great deal of valuable, real-life field information. Armed with this feedback, GM introduced its Second Generation of New Look transit buses in 1963. In logical fashion, the new 40-foot transits were called TDH/M-5303 and 5304 (at widths of 102” and 96”, respectively) while the 35-footers were known as TDH/M-4518 and 4519 (at widths of 102” and 96”, respectively). Corresponding 35- and 40-foot suburban models were SDH/M-4502 and 5302. These buses incorporated numerous design changes that had been prompted by the in-service experiences of the First Generation New Looks. Most of these changes were evolutionary and subtle, mainly intended to reduce maintenance and repair costs. Single-arm windshield wipers were used instead of the earlier pantograph type. Marker lamps were changed from square to bullet shaped, and the bright metal trim pieces that had adjoined them were eliminated. Engine air intakes were louvered to prevent water entry. The tailgate assembly was redesigned to eliminate the fiberglass “nacelles” that had surrounded the stop/turn and tail lamps. Butterfly-type side window latches were used in place of earlier push-button latches. Molded rubber fenders lined the front wheel housings. Early 5303’s used only lever-actuated mechanical parking brakes; NYCTA’s units were so equipped. Toward the end of the model run in 1967, the air-operated DD-3 “ICC” parking brake valve was offered. It was actuated by a round push-pull button mounted in a cylindrical riser assembly that was mounted to the floor at the right side of the B/O’s seat; QTC’s 5303’s and 5304’s were so equipped. Most TDH-5301’s used the 2-stroke Detroit Diesel 6V-71 engine mated to the Allison VH hydraulic transmission, although some SDM-5302’s and later TDH-5303/4’s were equipped with 8V-71N engines (which normally had been restricted to parlor bus applications only). Most NYC bus operators did not require high horsepower for their normal services, and stuck with the proven, more economical 6V-71N engine. The TDH-5303 became a runaway favorite nationwide: 6,205 units were sold and the model ultimately became the best-selling Fishbowl. As they had done with the earlier TDH-5301/2, NYC bus operators eagerly bought large fleets of Second Generation Fishbowls. This time, the leader was newly-created MaBSTOA (formed in 1962 by NYC’s acquisition of FACCO and ST): they bought a staggering 1,560 TDH-5303’s from 1963 to 1967. MaBSTOA 3301-3555 were acquired in June 1963 (contract MB-14OA), and were assigned to West Farms and Kingsbridge Depots , where they helped to replace aging ex-ST Mack C-45DT’s and C-47DT’s and veteran ex-ST GM D-4506’s and 4507’s. They had front longitudinal seats (green fiberglass) and red 2-and-2 rear seats. 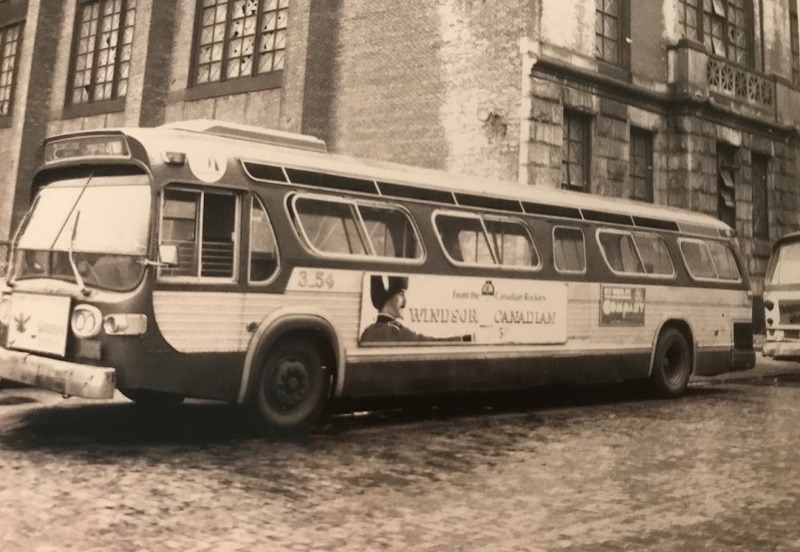 As with the 5301’s, they used manually operated single-piece front destination signs with white lettering on a black background; small, manually operated side destination signs were installed in the curbside standee window strip just ahead of the exit door. They also had front run number boxes installed inside on the right dash panel, and had manually operated rear route sign boxes mounted inside the lower right hand corner of the rear window. The 5303’s operated by NYCTA/MaBSTOA likely were equipped with parking lot heater connections. MaBSTOA 3472 was fitted with Transign “Bus-O-Rama” illuminated advertising panels (sometimes nicknamed “batwings”). These panels brought supplemental advertising income to the OA and, alter, to the TA. Buses thus equipped were sometimes known as “winged Fishbowls”. MaBSTOA 5201-5525 were built in December 1964-March 1965 (contract number unknown). They were assigned throughout the MaBSTOA system, and helped to retire the last of the oldest GM Old Looks in Manhattan and The Bronx. MaBSTOA 5516-5525 again were delivered with Bus-O-Rama panels; these panels also had large manually-operated destination signs mounted amidships on both sides, and had fluted front side panels to which were affixed circular red and blue “OA” emblems. MaBSTOA 6401-6900 were delivered in October 1965-February 1966 (contract number unknown), assigned to all MaBSTOA depots; 6701-6900 were built with Bus-O-Rama panels. These new buses allowed the retirement of more GM Old Looks. MaBSTOA 8301-8780 were built in January-February 1967 (contract number MB-17OA). These were delivered with Bus-O-Rama panels, plus they also had all-longitudinal seats and air conditioning, the first fleet of MaBSTOA buses to be so equipped. They were assigned to depots across Manhattan and The Bronx, and allowed retirement of various GM Old Looks and Mack C-49DT’s. During this same timeframe, NYCTA was less active with Fishbowl purchases than MaBSTOA, picking up 552 TDH-5303’s in 2 large orders. NYCTA 3601-3950 were built in July 1963 (contract number MB-14), and were assigned to the 126 St., Crosstown, Ulmer Park, and Jamaica Depots. They were equipped with longitudinal front seats (gray fiberglass) and red 2-and-2 rear seats. NYCTA 8001-8202 were built in February 1967 (contract number MB-17), and were assigned to Flushing, Jamaica, Flatbush, and 126 St. Depots. 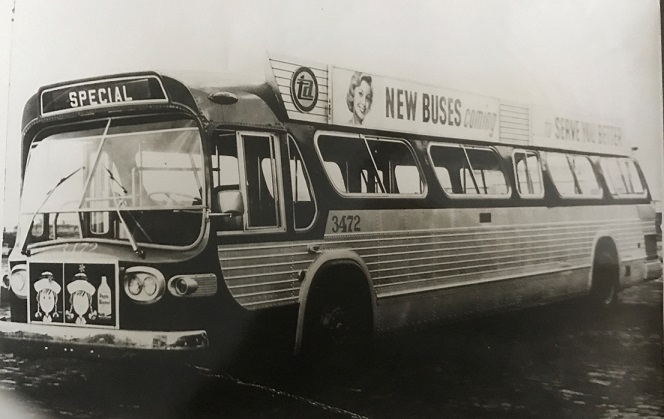 Like their MaBSTOA sisters, these were delivered with Bus-O-Rama panels, all-longitudinal seats and air conditioning, the first fleet of NYCTA buses to be so equipped. They retired the remaining TDH-5101’s. In common with the TA’s fleet of TDH-5301’s, NYCTA and MaBSTOA TDH-5303’s were delivered in the dark green livery of the period, but later were repainted into the two-tone blue color scheme of the 1970’s; some units eventually were repainted into the new white and blue livery. Emblems eventually were changed from the red and blue TA or OA to two-tone blue “M” logos. They were the last TA/OA Fishbowls delivered without Michigan Markers. During 1968-1969, they were equipped with 2-way radio equipment and rooftop antennae (covered later by protective hoods), along with gooseneck microphones and 4-bar barriers over the lower portions of the operator’s window. The TDH-5303’s were reliable machines that lived long, productive lives. 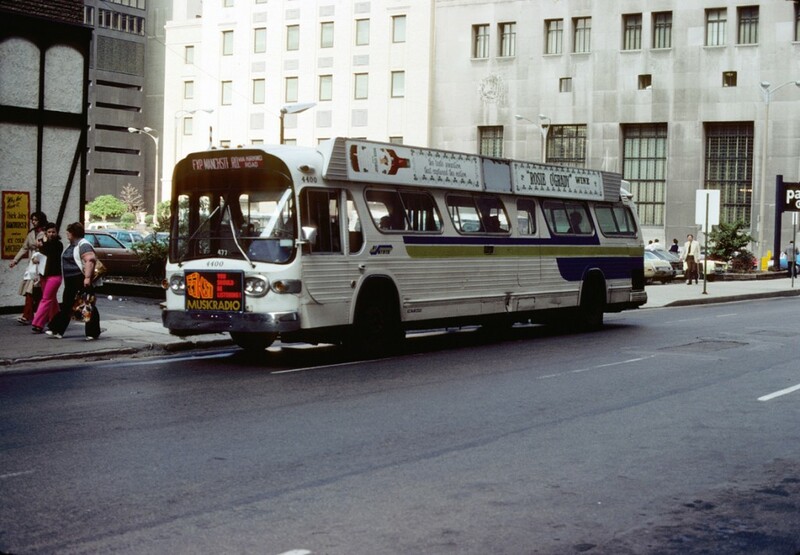 The older units were replaced by ADB’s in 1981-1982, while some of the newer “winged Fishbowls” lasted until 1990. Additionally, 23 members of the 8000-series buses were rebuilt by Blitz Body Co. in 1984-1985. These units received numerous upgrades (including white and blue paint schemes, blue longitudinal hard seating and a boxy structure installed at the middle of the rooftop). Renumbered NYCT 5000-5022, they were assigned to MaBSTOA’s 100th St. Depot and were retired from 1993-1995. The TA’s Vintage Bus Fleet contains 2 TDH-5303’s: NYCT 3758 and MaBSTOA 8466 (which when not on display are stored at Jackie Gleason and Fresh Pond Depots, respectively). In the top photo of the rear end of the NYCT TDH-5301, one clearly can see the individual fiberglass "nacelles" that surround each tailgate lamp. This tailgate arrangement is among the major spotting features that distinguish the First Generation Fishbowls from their younger siblings. In the lower photo of the rear end of NYCT 3758, you can see how the styling of the stop/turn/tail lamps has been "cleaned up" by removal of the nacelles that formerly had surrounded each fixture. The rear window of NYCT 3758 also illustrates the later 4-piece design that had been adopted on most Fishbowls to reduce the costs of glass replacement. Mr. Linsky has posted pictures of GBL 426 and GBL 538 (TDH-5301 and TDh-5303, respectively). This set of photos admirably shows the front-end differences that exist between the First and Second Generation of Fishbowls. Those amber, trapezoidal-shaped marker lamps on GBL 426 (along with the bright metal trim pieces installed just aft of these same lamps) were key frontal spotting features of Gen. 1 GM New Looks. Such ornamentation is missing from GBL 538, which uses the smaller "bullet" type amber marker lamp without an accompanying trim piece. Supposedly, such markers were more resistant to breakage and passed through automated bus washers much more easily than did the more ornate lamps used on the Gen. 1 Fishbowls. 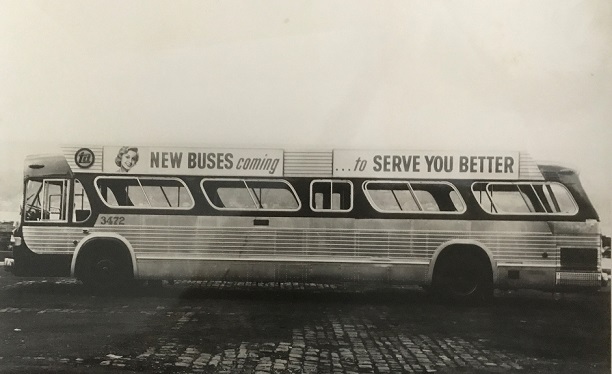 The MABSTOA 6401-6900 order delivered between October 1965 and February 1966 (as well as Flxible's NYCTA 5601-5790 order) was the first whereby all buses were built with the 4-piece rear window arrangement at the outset, with the preference thereto (for maintenance and glass replacement cost reasons) having reached those in charge of ordering new buses. This continued for as long as "fishbowls" were built that way - up to the 1973-77 Flxible bus orders with the one small rear window. I presume the contract number for the 1964 order for MABSTOA would have been MB-15OA, and the 1965 order, MB-16OA - they would have to be if the 1963 order was MB-14OA and the 1966-67 order, MB-17OA. I say this due to the parallel orders to Flxible for new NYCTA buses in that same period being MB-15 and MB-16, respectively. That's why no "fishbowls" were ordered for the TA in the 1964-66 period - they went with "Flx" instead. First, note the sharp angles of the bat-wing as compared to the later bat-wings that were more rounded and eye pleasing. Also note that it lacks a center destination sign. This is a MaBSTOA bus even though the emblem on the wing says NYCTA. In this view you can compare the final version of the bat-wing. Also, note the aluminum belt how it comes to a straight end rather than the standard production of a angle slope. This is not evident in the Museum bus, #8466. Also, note the bus in the background. 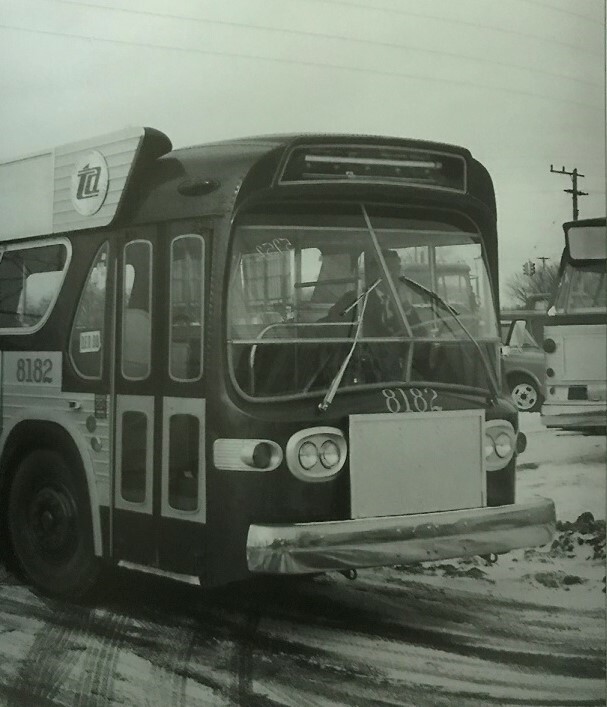 Both MaBSTOA and NYCTA placed aluminum covers over the air conditioning condensers during winter on these buses. The practice I believe lasted one or two winters. BTW, these buses had their roofs painted white to reflect the sun during the summer months. I wonder if center destination signs were optional. 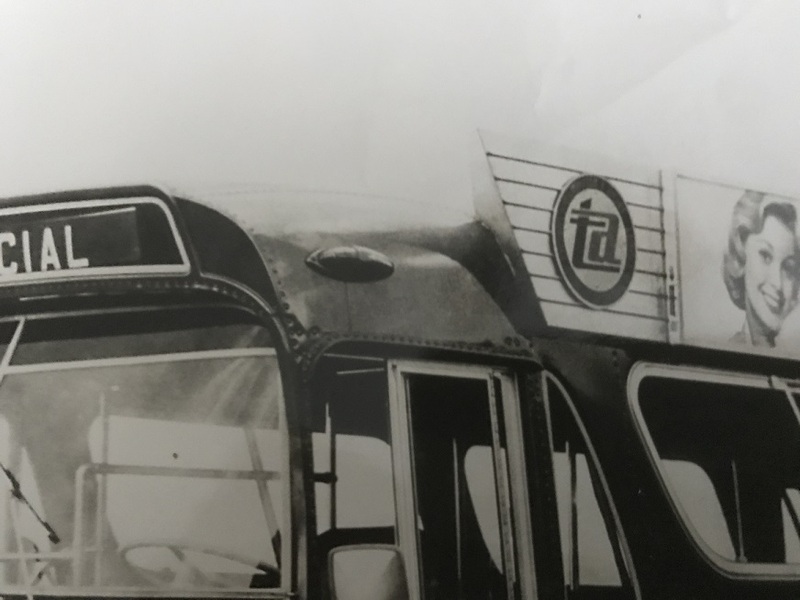 I know that Public Service Coordinated / Transport of New Jersey "Fishbowl" buses that had "batwings" had that metal frame in place of where the center destination signs would have been. 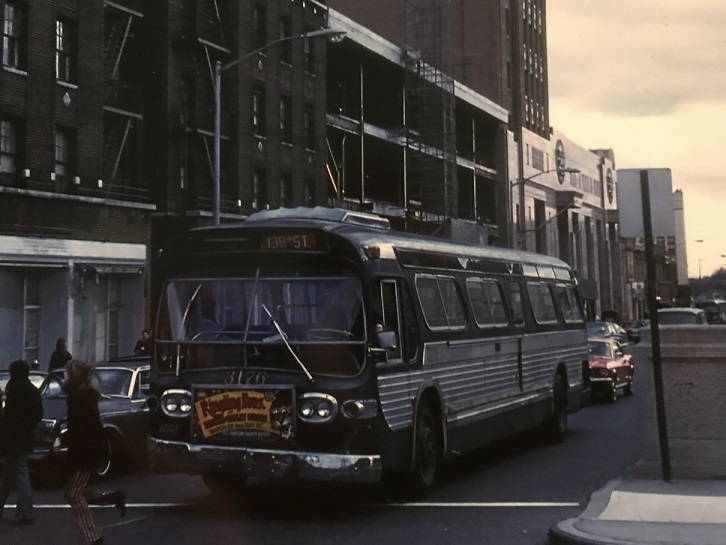 I've seen a few early '70's pics where un-updated roll signs on the sides would have, say "2 - MADISON AVE VIA 116 ST" on the uptown 2A route, or "2 - 5TH & 7TH AVENUES" if going downtown on same. 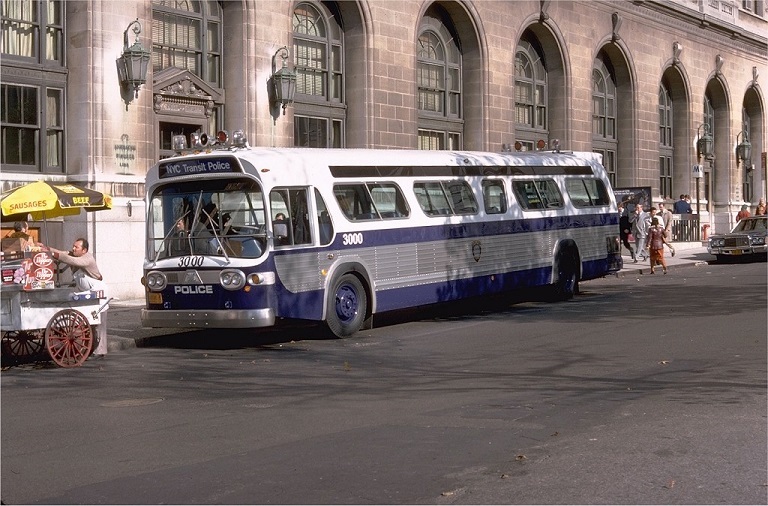 Likewise, after the 1969 shift of ex-NYCO 2 to Lexington and Third via Lenox as M-101A, I've yet to see a batwing side sign that said "101A - 3RD-LEX-LENOX AVES." MaBSTOA buses 8301-8780 had the same straight end in their paint scheme where you described. Looks like on 8466 it became "sloped" at the point of the repainting job while being restored. 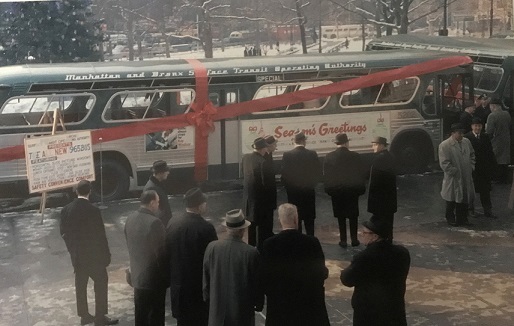 MaBSTOA's 5201-5525 gift wrap and on display at City Hall when new in 1964-1965. Through the trees you can barely see some Old Looks and directly above the word "Authority" in the distance is a Flxible suburban New Look. Posted: Thu Aug 24, 2017 9:25 pm Post subject: When brand new! 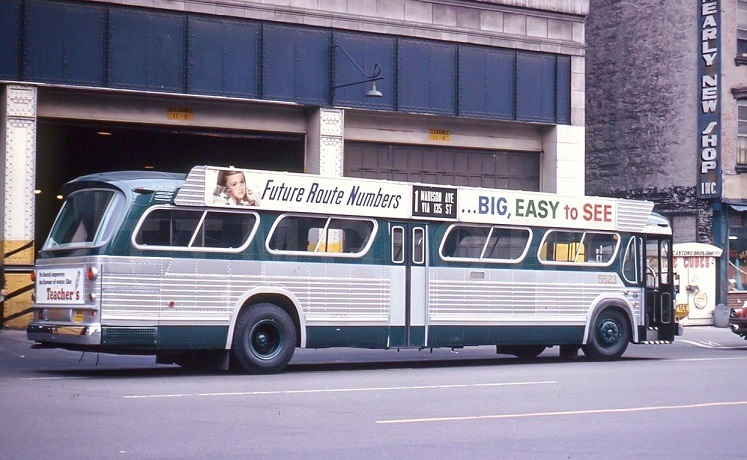 Parked outside the 54th Street Depot, number 5523, showing route 1 Madison Ave. via 135th St., a TDH-5303, with billboard signs installed at the factory minus the side ad racks and the agency logo on the forward wing. However, the acronym MaBSTOA appears on a decal (white with green letters) above the front door. Posted: Thu Aug 24, 2017 10:40 pm Post subject: Re: When brand new! I.I.N.M., the side sign of this batch would have also listed '2 Madison Ave. via 116 St.' and '2 5th & 7th Avenues'. Post-1966, how many buses with this particular kind of sign listed the former as it was going uptown, and the latter when riding downtown? Even after 1969 when the 2 (5th-Madison-Lenox) was rerouted and rebranded 101A (3rd-Lexington-Lenox)? Speaking of batwings, St. Louis's fishbowls that had them had the point at the bottom. Low branches would have been the death of many batwings had the point been at the top. Note that these batwings are interchangeable from one side to the other. The side you install it will determine if the point at the front is at the top or at the bottom.